�����The Whitman Baltimore Coin Expo begins on Wednesday for dealers, and many will be making their way to the area as early as today. Dealers remain very aggressive in their efforts to locate the coins they need for their customers. With the current focus on bullion coins, most shops are trying to fill these needs as quickly as possible. Dealers have been reporting that as much as 75% of their business lately has been for Gold, Silver, or Platinum coins. Granted, older U.S. generic Gold falls into this category as well, but it just shows how much influence the economy is having on the average American. Whether the metals are up or down, we all want the security of hard assets in today's climate. �����Better date Seated coins are very difficult to locate in problem-free condition. 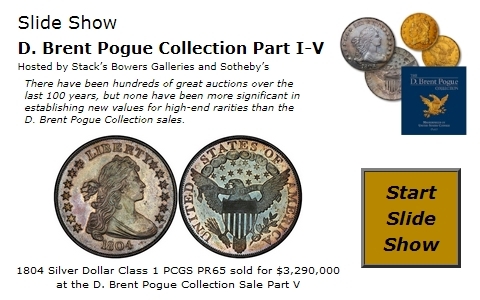 It doesn't matter whether they grade Good or AU55, if a coin that collectors have not seen on the market for a long time shows up in a retail ad, you had better be quick to call. For example, the Market price for the 1865 Seated Dime in VF20 increased to $540 this week; there are only two coins certified by NGC and PCGS in this grade. Most of the trading information comes from Mint State coins. When we see minor problem graded coins of like rarities, because they are so few and far between, they will usually bring prices comparable to the current FMV as long as they are not totally damaged. Advanced collectors for these coins are very aggressive and know they may not get another shot at locating this specific date. �����There are sporadic adjustments throughout this week's LD Wholesale Market Dealer Price Guide due to recent trading information. Most of the changes in Copper coins are upward. Many of the early Lincoln Cents, especially with mint marks, are very tough to find and are easy to sell. In addition, the higher the grade and the closer to full Red will push the premium on many of these coins.